The official tourist agency for The Faroe Islands is pretty smart when it comes to viral marketing. Its latest campaign takes the unusual approach of declaring the islands closed to visitors for the month of April, but open to volunteers who wish to help preserve the natural environment that makes the islands so special. It is a nifty way of shipping in some free labour, bringing in the voluntourist dollar and raising awareness among key markets, and it has us hooked. Okay, it's an advert for an outdoor clothing brand posing as an adventure video. But it's still good. And that's why we're sharing it as our latest flotsam video find. Click above to watch three intrepid climbers take on the world's largest sea cliff in the Faroe Islands. With just 80,000 people speaking Faroese worldwide, it's perhaps understandable that the language hasn't made it onto Google Translate. But try telling that to the growing number of frustrated tourists who can’t learn a few phrases before they visit. 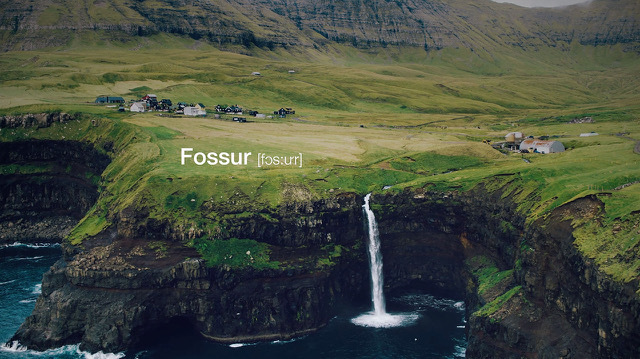 In an effort to solve the problem, Visit Faroe has launched its own version of the online language tool with the help of friendly locals who will translate live by video, thus providing a free on-demand service for anyone around the world curious to learn a little Faroese. And the best thing - it really works. Try Faroe Islands Translate for yourself. The island of Stóra Dímun in the southern Faroe Islands is home to just nine people. Accessible only by helicopter or boat, it remains largely untouched, save for an organic farm which marks its only settlement. A supplier to Koks, the world-renowned restaurant in the Faroese capital Tórshavn, the farm produces some of the finest lamb and turnips available anywhere. It is also located within an incredibly dramatic land and seascape, as this video shows. A recent Guardian Books podcast features an international array of island writers who had gathered in the Faroe Islands for a conference about the island in literature. Included are Iceland’s Sjón, Greenlandic novelist Niviaq Korneliussen, Shetlander Robert Alan Jamieson, Newfoundlander Donna Morrissey, Tasmanian Pete Hay and Jamaican poet Paulette Ramsey. The Faroese academic Bergur Rønne Moberg also took part by introducing his intriguing theory on the literature of the ultra-minor. The ancient lore of The Faroe Islands is the focus of an unusual and beguiling piece of publishing by Cereal magazine, one that combines mesmerising photography with a Tolkienesque narrative. We highly recommend taking a look. The Faroe Islands may be the island musical capital of the world. One reason for this is the songwriter Eivør. Possessing a voice of rare beauty and power, her earliest forays into music making were steeped in the traditions of her youth. An enduring love for traditional Faroese culture remains at the heart of her work, although its expression has been widened by an array of other musical styles, taking in jazz, country, big band, classical and trip hop. Already well known in Iceland, Denmark and the US, Eivør is poised for world superstardom, which looks every more likely now that major broadcasters like the BBC are snapping up her work for epic drama serials.